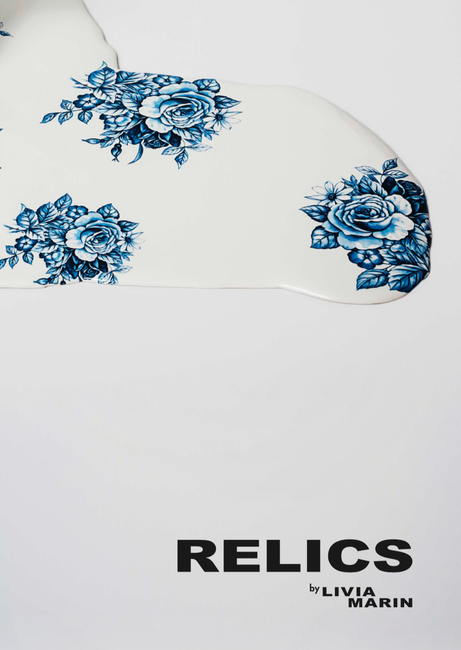 It is in the title of the exhibition, “Relics”, and in the summaries of the various sections: “Adrift”, “Remnants”, “Shards”, that the sense of Livia Marin‘s ultimate research is contained, which lies not in the construction but rather in the dismemberment. A way that had already been expressed in the series “Broken things”, displayed at the Triennale in Milan last spring, where “at the limit of the shape” the Chilean artist melts a number of porcelain objects, including some Victorian chinas, emphasizing the paradoxical evolution of handcraft: from the time when art was handcraft and the industrial production standardized the products, by making them mere mass-consumption objects, that is commodities, we move to modern times when the same products, and images, subject to new stylish interpretations are revived and brought back to their original state of works of art. But in “Relics” the dismemberment is replaced by fragmentation, almost as if the sense of the art could only exist inside the fragment. If in the previous works a trace of the original form persisted, in this series the explosion of patterns does not allow any reconstruction of the original shape, but rather every single shard becomes independent, every piece becomes a symbol, capable of representing the whole and not only a part. Perhaps this is the strength of the symbol: in ancient times the half of the broken coin, the one called “tessera hospitalitatis” by the Latins, the pass that needed the missing part to be complete and fulfil its task of identification tag. Also from an etymological standpoint, the symbol (from the Greek syn + ballo, throw together) is therefore the visible part which refers constantly to the invisible part, a bridge connecting two ends, where the first one is known, while the second one can only be guessed. And it is exactly in the relation which is not completed and can never be completed " but rather it always acquires new meanings with every new interpretation " that lies the strength of this gnoseological mechanism which has always been at the foundations of making art. It is not by chance that, in “Broken Willow”, Livia Marin presents " on small supports that remind the Aztec obsidian mirrors " pieces of Willow patterns which can only vaguely recall " by similarity " the 18th and 19th century ceramic chinas, almost as if she was interested neither in any arguments about the reception of a falsely exotic model in the Western world, nor in the fact that this aesthetic model persisted for more than two centuries, and whose effects lasted until today as daily home memories. On the other hand, there had been a wide diffusion of Blue Willow since 1780; a fashion that, from England, spread rapidly throughout Europe, to the extent that the plates and bowls decorated with it became a precursor of pop art and at first they were seen “chic” and later " because of their mass production " seen as “kitsch” and, finally, by virtue of an aesthetic awareness today reconsidered as “camp”. In this sense, Livia Marin‘s work is very far from the one by Robert Dawson, whose ceramics “After Willow”, in the collection of the Victorian Albert Museum, represent the totally post-modern attempt to profit from an ancient image, distorting it or enlarging it, and exploiting its being recognisable and the nostalgia that it causes, emphasizing its kitsch features and using irony as the best tool to read it. On the contrary, there is no irony in Marin‘s works: it looks like she is interested mostly in the stylish aspect, that is, the possibility to build new works out of old patterns, with a completely different and fulfilled sense. 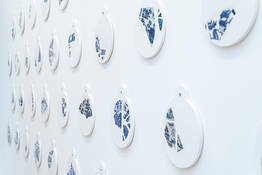 But these new works are technically “drifting”: the tea cups displayed upside down, wobbly, in a sort of temporary installation, as almost disappearing from the shelf, represent perfectly the idea of an art that, at the same time, struggles to remain and wants to emerge, which aims at staying yet in pieces. And it is innate in remaining a sacred dimension, because also the remains of saints and martyrs worshipped over centuries are relics, things that remained, survived to the gradual weariness and deterioration caused by time and, therefore, sacred, to be worshipped. Besides any political or sociological interpretation, which also characterized her artistic pathway, Marin‘s work is marked by the stylish precision, the total accuracy in the composition, for her technical skills which allow her to use different media and materials: then again, we can only recognise Beauty by approximation and, perhaps, the sense of art is actually in the fragment, in the relics, a tiny beauty that recalls the beauty of the whole.